In a move that embodies its mission to unleash the potential of communities to thrive, RiseBoro Community Partnership is launching an inclusive wellness space: a brand-new community farm. 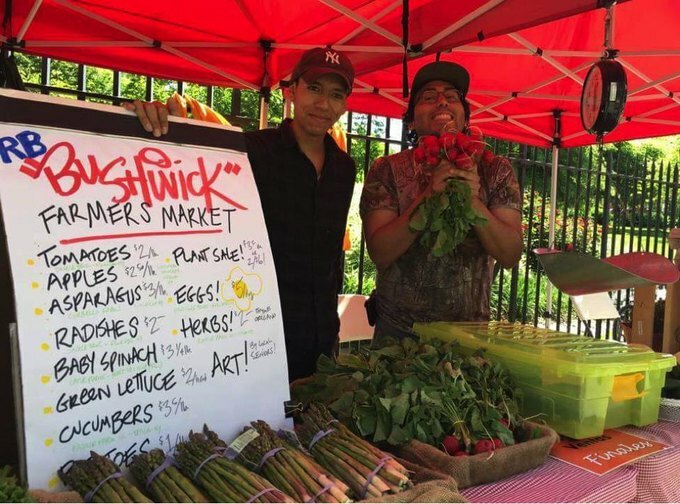 The farm is part of RiseBoro’s Bushwick Cooks holistic health programming, along with the RB Farmers Markets and Community Food & Health Survey. The Bushwick Grows! 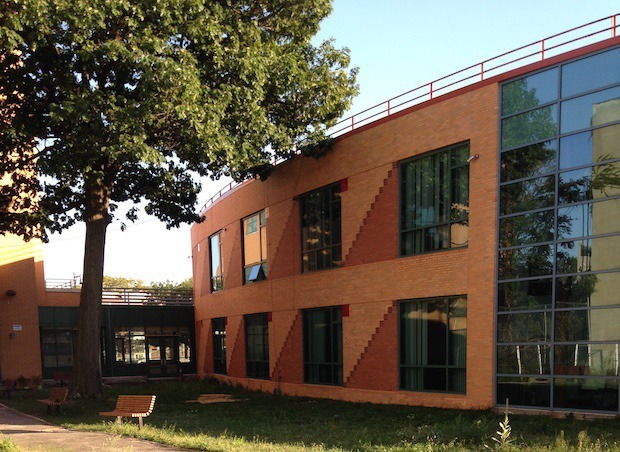 Community Farm will launch this May in the 5,600-square-foot yard of the RiseBoro Youth Center at 1474 Gates Ave. “It’s a lovely open space with a giant oak tree, but it’s currently underutilized,” says Androniki Lagos, Program Manager of Bushwick Cooks. The farm will be open to the community for hands-on experiential learning and will be programmed according to Bushwick residents’ interests, goals, and needs. RiseBoro envisions that participants of all ages will have the opportunity to take fresh produce home. “Mostly, we want the farm to be a lively space where everyone from the area can congregate and learn together,” says Lagos. RiseBoro is pursuing the farm now, in year two of Bushwick Cooks, giving the organization time to invite more community input into how the space is designed and what programming should be offered there. RiseBoro is proud to partner with New York Restoration Project to procure materials for the project and develop a community-led design process. To that end, they’re hosting three Saturday design workshops at the RiseBoro Youth Center this month, each from 1:30-4:30 p.m. (The first, "Getting Acquainted," just took place on March 3.) RiseBoro hopes you’ll go — and bring “your mama and your cousin too!" says Lagos. "We want everyone from the community to feel welcome to come and share their ideas, and just enjoy the space.” No need to RSVP: just show up. 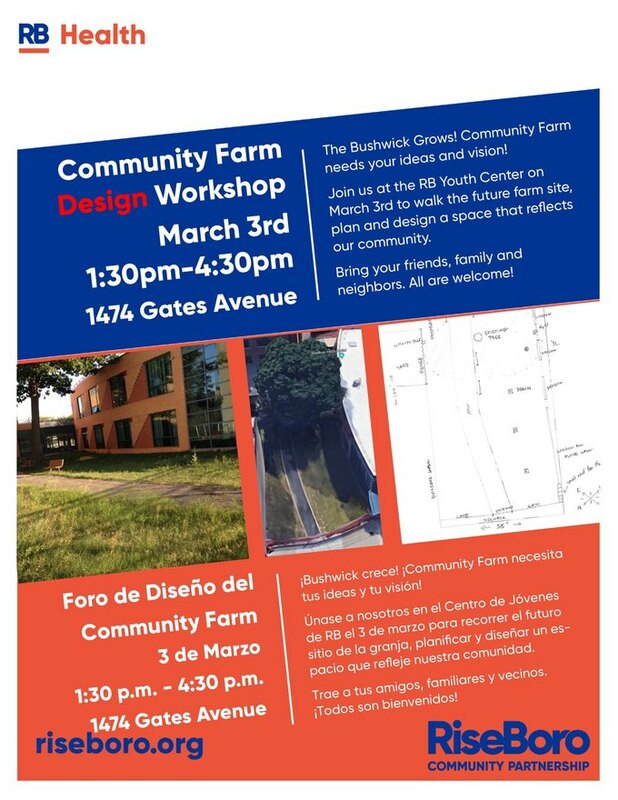 March 17: Design selection workshop: The ideas collected at the first workshop will be incorporated into at least two designs for the farm; participants will vote on their favorite. March 24: Final design presentation: RiseBoro will present the final collective design and discuss the project’s next steps. When it comes to planned activities on the farm, RiseBoro is developing a range of workshops, including cooking demonstrations and classes on harvesting and storing produce, while others will be more agricultural, like a “seeds, soil, and compost” class, or “introduction to ecosystems.” In all cases, RiseBoro will sync its schedule with the seasons: they plan to be open year-round. While many offerings will be focused on youth, there will be ample programming for all ages. To keep up with the Bushwick Grows! Community Farm, visit the RiseBoro website, Facebook page, and the RB Farmers Market Instagram. If you’d like more info, have questions, or want to help, send an email to bushwickcooks@riseboro.org. In the near term, Lagos says lots of volunteers will be needed to help with some heavy lifting and other construction-related tasks prior to the opening in May.